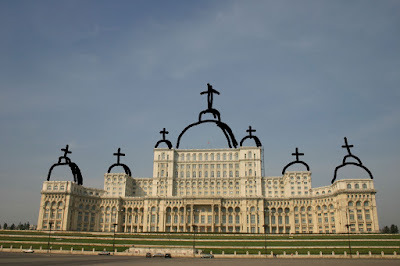 "When the news spread that the Romanian Orthodox intends to erect a monumental ‘Cathedral of National Redemption’, the artist proposed a morphing, a quick solution to both problems: the House itself can become a cathedral, by simply adding the generally recognizable signs of piety in the public sphere, dome and cross. No other adjustments would have been necessary to accommodate the new breed of megalomania, in the context of a perverse alliance between the ideology behind the House and the one evinced by the plans of the Orthodox Church, in a country trapped somewhere between the 19th and 21st century, still boasting its role in the Middle Ages as “defenders of faith” and where populist initiatives can display a remarkable opacity to the present and its imperative questions. Made last year, Vlad’s proposal brought together theoretically disparate realities; yet recent developments have confirmed what appeared at first to be no more than a quirk. Those disparate realities have come to articulate a closed, inescapable network, proving the artist’s derision prescient. After a few possible locations for the Cathedral were rejected, the site under consideration now is precisely the lawn in the back of the House, the only impediment being that the foundation of the Cathedral might affect the underground defense tunnels which spread from the House towards other locations vital for national security. 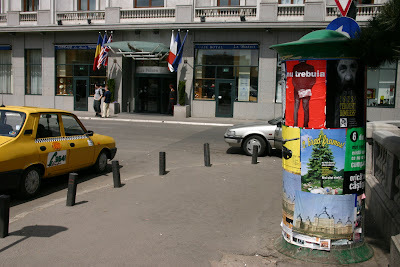 This enfolding of military secret, conspiracy theory, late and falsified religiousness, megalomania and populism qualifies the House as a strange attractor for misplaced ambitions and unspoken political desires, as well as the perfect backdrop for acting out the post-communist syndrome. If the plan of church-plus-government is to enlist the support of that segment of population which needs this cathedral, and meanwhile safeguard the imperial isolation of the House, then the project of the Cathedral can work. If the plan is to cover the whole idea – and necessity – of urbanizing the House with a thick layer of ridicule, then the project is truly advisable. If the grandiosely confused plan is to build a sacred counterpart to the obscene violence of the House of the People, then the project is ill-advised. So is any thought that this might infuse life to an entire area ravaged by communist urbanism, or trigger the post-traumatic process."